Propagation of plants occurs by sexual or asexual means. Sexual propagation involves growing plants from seeds; asexual (vegetative) propagation, from a part of the plant. It is important to understand that a seed is produced as a result of sexual union. The seed contains genetic characteristics of both parents. Unless both parents are genetically similar, the seedlings that result can be variable. Most vegetable and annual flower seeds are produced by seed companies whose practices ensure that such seeds will yield uniform seedlings. Seed companies are producing Ft hybrid seeds of many kinds of vegetables and annual flowers. These hybrid seeds are produced by crossing two inbred lines. The seedlings from such seeds are very uniform and exhibit hybrid vigor. If seeds are collected from Fj plants and planted, the resulting seedlings will be variable. It is important, therefore, not to save the seeds of Ft hybrids for planting. A seed contains an embryo plant surrounded by a supply of stored food and is protected by a seed coat. A mature seed stored in a cool, dry place retains its ability to germinate for some time. This time varies with different seeds. It is generally best to buy new seeds each year. Before planting seeds that you have carried over from a previous year, a germination test should be run. This is accomplished by placing a wet blotter in the bottom of a covered dish. Count a number of seeds and scatter them over the surface of the blotter. Replace the cover and put the dish where the temperature is about 70°F. Watch for germination and determine the percentage of seeds that grow. It is important that the resulting seedlings show vigor. Seeds that send out weak sprouts may not produce healthy seedlings. Bean seed and germinating seedling: a. epicotyl, b. hypocot-yl, c. radicle, d. cotyledon, e. seed coat, /. radicle, g. hypo cotyl, h. true leaf (from epicotyl), i. cotyledon, /. stem (from hypocotyl), k. root (from radicle). downward into the soil to form the root system. In most seeds of dicotyledonous plants, the hypocotyl elongates to elevate the cotyledons, or seed leaves, above the soil. The epicotyl, which develops between the cotyledons, grows upward to form the leafy stem. In a few dicolyledonous plants such as the pea, the hypocotyl does not elongate and the cotyledons remain in the soil as the epicotyl elongates to form the leafy stem. In monocotyledonous plants like corn and onions, there is a single seed leaf. Most garden vegetables and some annual flowers are seeded directly in the garden. The depth of planting and the proper time for planting are important considerations. There are no fixed rules for ascertaining the correct depth of seeding. Generally, the depth is dependent on seed size. Small seeds should not be covered with more than V2 inch of soil. Large seeds can be planted from 2 to 3 inches deep. The amount of moisture in the soil also determines the depth of seeding. In early spring, when the soil is cool and moist, shallow seeding results in faster germination. The proper time for planting seeds varies with the location and the season. Usually, for each 100 miles north or south of the Twin Cities, there is about a week's difference in timing. Seeding can be done earlier on sandy soils that warm up quickly in the spring than on heavy clay soils. Frost-tolerant plants may be seeded as soon as the soil can be worked in the spring. Warm-season plants should not be seeded until the soil has warmed up and the danger of frost has passed. Some plants that have a long growing season should be started indoors or purchased from a commercial grower. Growing healthy plants indoors is a challenge and requires skill and attention to details. Plants of most flowers and vegetables can be grown in approximately 6 to 8 weeks. Seeds should not be started too early or plants will be tall and leggy. Knowing when each kind of plant can safely be planted outdoors in your area is essential to success in growing plants. The most common problem when growing plants is lack of light. Unless you have a greenhouse or ample sunny windows, fluorescent light in the basement provides the answer to the light problem. "Damping off" of seedlings, another problem when growing plants, is caused by soil fungi and can be transmitted on dirty containers. It is best controlled by starting seeds in new containers or clean, used ones and by using sterile growing mediums like Jiffy Mix. If you use soil, the soil should be sterilized by baking it in a 200°-250°F. oven for 30 minutes. Treating the seed with a good fungicide may help, too. Seeds can be started in shallow flats or flowerpots. Fill the container with the growing medium to within about Va inch of the surface. Plant the seeds in shallow rows if you are using a flat or scatter the seeds on the surface if you are using pots. Cover the seeds lightly with the growing medium. Water by partly submersing the container in water. When moisture shows on the surface, remove the container from the water and place it in a warm place where the temperature will be about 70°F. Cover with a sheet of glass or plastic to conserve moisture during the germination period. As soon as the seedlings start to emerge, the cover must be removed and the seedlings given adequate light. Water with a fine spray or mist. In about two weeks, or as soon as the first true leaves form, the seedlings should be transplanted, giving every seedling about a 2X2 inch space. Some growers use individual containers for each seedling. Seedlings should be hardened before being planted in the garden by putting them outdoors about 7 to 10 days before planting them in the garden. 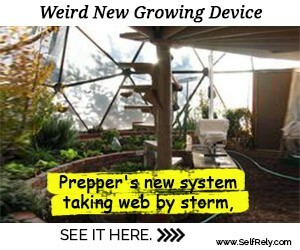 Select a sheltered location and be prepared to cover the plants or move them inside if a storm or frost is predicted. A cold frame is an ideal place to harden plants. Many garden plants are propagated vegetatively rather than from seeds. The method ensures trueness to type for plants that do not grow true from seeds, for example, most cultivars of woody fruits and ornamentals and many perennials, and includes propagating plants that do not produce viable seeds. Vegetative propagation is accomplished by cuttings, layering, grafting, division, and tissue culture. 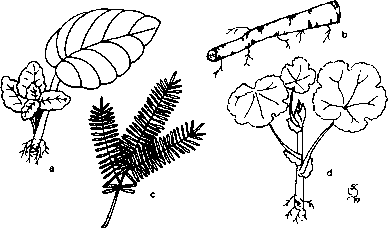 Types of cuttings: a■ leaf (African violet), b. root (horseradish), c. evergreen (yew), d. herbaceous stem (geranium), e. hardwood stem (grape). plants, stem cuttings are employed. Herbaceous and softwood stem cuttings are taken during the active, growing season, and evergreen and hardwood stem cuttings are secured from mature growth usually in early winter. For some plants a leaf or even a portion of a leaf is used; for a few plants, root cuttings give the best results. All cuttings are best rooted in suitable, sterile mediums. Washed sand, like that used in making concrete, is excellent for most plants. Perlite and vermiculite are also employed. For acid-loving plants, like blueberries and azaleas, a mixture of sand and acid peat is used. Some means must also be provided to ensure high humidity during the rooting process. Misting is used in commercial greenhouses, with good results. Plastic-covered frames and containers also help increase the humidity. Cuttings should be taken from healthy stock plants that are true to type. Herbaceous and softwood cuttings should be obtained when new growth is fully developed but before tissues become hard and woody. Terminal cuttings are generally best, but if prop agating stock is scarce, cuttings can be made from a section of the stem. The length of the cutting is variable, depending on the type of plant and its rate of growth. Most cuttings are from 3 to 5 inches long. Using a sharp knife or razor blade, make a clean basal cut, preferably at a slant and through a node. Remove the lower leaves but retain two or more leaves at the tip. Cuttings that are difficult to root should be dipped in a hormonal powder like Rootone. With a knife or a narrow board, make a narrow trench in the rooting medium. Insert the cuttings, spacing them about 2 inches apart. Firm the medium against the cuttings. Rows should be about 4 inches apart. Water the cuttings and repeat as required to keep the medium moist but not wet. For best results, the temperature of the rooting medium should be a few degrees warmer than the air temperature. This can be accomplished by placing the propagating container over a radiator or by using a light bulb in a box below the container. If you are planning to make only a few cuttings, a flowerpot can be used and a plastic bag placed over the pot and held in place with a rubber band. The plastic allows light to enter and keeps the air moist around the cuttings. During the rooting period the plants should be located in good light. As soon as the roots have developed, the cutting should be removed and potted in soil that is high in organic matter. The time required for rooting can vary from a few weeks to 6 or more. For more cuttings, a simple propagating box can be made from a wooden peach crate or similar box. Replace the slatted bottom with a solid board. Cut four pieces of window glass to fit snugly inside the walls. Tape the corners and use two pieces of glass for the cover. For maximum humidity, keep the two pieces of glass together. As roots form, the two sheets of glass can be separated to allow ventilation. Another simple method utilizes a strip of cloth or plastic. Place moist sphagnum moss on the surface and lay the cuttings on the moist sphagnum. Roll the cloth or plastic with the cuttings to form a cylinder, with the cuttings projecting at the top. These cylinders can then be placed in round containers with a little water in the bottom. The sphagnum will serve as a wick to keep the cuttings moist. Evergreen cuttings are normally taken in early November and placed in a greenhouse bench filled with sand. They will usually be rooted by spring. Hardwood cuttings, also obtained in November, should be 8 to 12 inches long, with several internodes. The cuttings are tied in bundles and stored over the winter in a cool, moist place. As soon as the soil can be worked in the spring, the cuttings are inserted into the soil at an angle, with the uppermost bud at soil level. The soil is then firmed to provide close contact with the cutting. Roots form along the basal part of the cutting, and leafy stems develop from the uppermost buds. Grapes, willows, and honeysuckle are often propagated in this manner. Leaf cuttings are used on a limited number of plants. The African violet is the best example. A clean cut is made through the petiole about 1 inch below the attachment to the leaf blade. The leaf and petiole are inserted in the rooting medium at an angle, with the petiole covered to the base of the leaf. 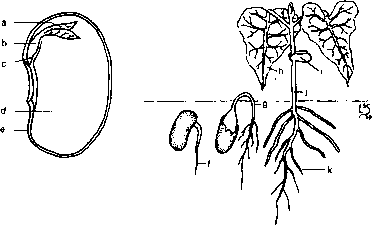 Roots form at the base of the petiole, and an adventitious bud develops at the base and produces several small plants. Certain large-leaved begonias can also be propagated from a leaf or even a portion of a leaf. A cut is made through the vein on the underside of the leaf, which is then placed flat on the rooting medium. Roots form above the cut, and an adventitious bud develops a new plant. Some plants like the kalanchoes form young plants along the edges of the leaf. 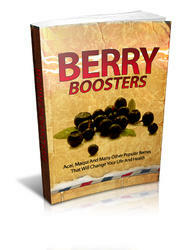 Blackberries, horseradish, and garden phlox are usually propagated from root cuttings. A section of root is placed horizontally in the rooting medium. Adventitious buds develop that produce new plants. Layering is another method of vegetative propagation. A tip layer is made by taking a young stem of a shrub like the Van-houtte spirea and bending it over until it touches the ground directly behind the stem tip. A notch is made on the underside of the stem at this point and the stem held down with a mound of soil placed over it. This is done in late summer. Roots form above the notch. When the tip is well rooted, which should be by the following spring, the stem can be cut below the point of rooting and the young plant moved to a new location. This method has the advantage of supplying water and nutrients from the parent plant to the new plant during the rooting process. Mound layering involves notching stems right above the soil line and mounding the soil around the base of the plants. Roots form above the notches and grow into the soil in the mound. Timing is the same as for tip layering. Currants and the rootstocks for dwarfing apple trees are propagated in this manner. Serpentine layering is used for vines like English ivy that trail on the ground. A stem is notched at several points on the undersur-face. Soil is placed over the notched portion of the stems. Several plants are thus produced from a single stem while it is still attached to the parent plant. Air layering is often used for reproducing large houseplants like the rubber plant and dumb cane which often grow too tall for the average home. A new plant can be started from the top of these plants. With a sharp knife, make a diagonal cut about two-thirds through the stem. Put a small pebble in the slit so that the surfaces do not grow together again. Wrap the stem at this point with moist sphagnum moss and hold the moss in place with a wrapping of clear plastic. Roots form above the slit and grow into the moist sphagnum. When the sphagnum moss is filled with roots, the main stem can be cut below the roots and the new plant potted in a suitable soil mixture. Grafting is another technique used to increase the number of plants. Most fruit trees and most cultivars of shade and ornamental trees are propagated by grafting, as are cultivars of conifers that prove difficult to root from cuttings. them from drying out. Scions can also be wrapped in aluminum foil or in plastic and stored near the freezing unit in a refrigerator. Nurserymen usually make the grafts in March on roots that were dug the previous fall. Gardeners often make their grafts in April on seedling roots that are growing in the garden. Various types of grafts are used to join the stock and the scion. 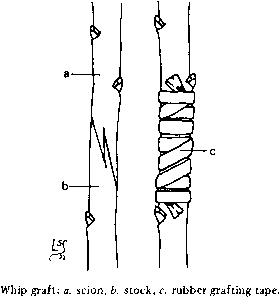 The whip graft is employed where the stock and the scion are approximately the same diameter. A diagonal cut is made on both the stock and the scion. The angle of the cut should be the same on each. A slit is then made parallel to the longitudinal axis about two-thirds the distance from the base to the top of the slanted cut. Next, the two pieces are joined by sliding the "tongue" of one into the "slit" of the other. It is important that the cambium of both stock and scion be in contact at least along one side. 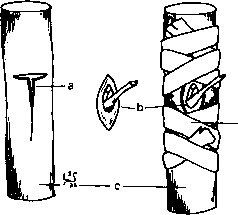 Grafting wax is often used to seal the union, but good results can be obtained by using rubberized electricians' tape or special grafting tape. Grafts made in the nursery cellar are usually covered with moist sawdust until it is time to line them out in the nursery. The roots should not be allowed to dry out. Bud graft: a. t-shaped cut, b. stock, c. rubber budding strip. Grafting from a bud is normally done in early fall. The buds should be mature, but the bark should separate easily from the wood on the stock. In budding, a bud stick is cut from the desired cultivar. The leaf blades are cut off, leaving a short portion of the petiole, which serves as a handle. When cutting the bud from the bud stick, a small shield of bark is removed. A t-shaped cut is usually made in the north side of the stem of the stock at or near the ground line. The bark is folded back and the bud slipped into place. The upper portion of the shield is cut along the line of the top of the "t." A rubber budding strip is used to hold the bud in place, but the band must not cover the bud. By winter the cambium of the bud shield has united with the cambium of the stock. In the spring the seedling stem should be cut directly above this bud at about the time that the bud begins to open. Stone fruits, roses, and certain shade trees are normally propagated by budding. Grafting is successful only when the stock and the scion are closely related. If possible, one should use the same species for both the rootstock and the scion variety. Grafts between closely related species are usually successful. Intergeneric grafts can sometimes be made, but the results are less likely to be successful. Grafts between two families are seldom successful. Plants propagated by stem or bud grafts are more expensive than seedling plants of the same size. This is because of the extra labor and time required to produce the plant. Division is another method of propagation that is often used on herbaceous perennials. Most fibrous-rooted perennials that develop a multiple crown, like garden phlox, daylilies, and chrysanthemums, can be dug in the early spring and separated into a number of divisions. Some can be pulled apart. Others must be cut with a sharp knife. Perennials with fleshy roots and rhizomes, such as peonies and irises, are best transplanted in late summer or early fall. The clumps are dug, divided, and replanted. Many garden plants produce fleshy storage organs called bulbs or corms. These increase naturally by offsets. Hardy kinds like garden lilies and alliums can be dug in the fall, divided, and replanted. Tender kinds like gladioli and Peruvian daffodils are dug in the fall, stored over the winter, and replanted in the spring. The commercial use of tissue culture in propagating garden plants is quite new. First applied to orchids, the technique is now used on a wide variety of both woody and herbaceous plants in laboratories across the country. In this method, entire plants are grown from fragments of meristematic tissue on a nutrient agar under aseptic conditions. The technique requires an autoclave for sterilizing the growing medium, a germ-free room for transferring the bits of meristematic tissue to the flasks containing the agar and nutrients, and a light room maintained at the ideal temperature for the growth of the plants being propagated. It takes several months for plants to differentiate from the meristematic cells. As soon as the plants reach a certain size and have developed roots, they are transferred to flowerpots and grown in a greenhouse until large enough to be planted in the nursery. Growing plants by tissue culture offers a rapid means of increasing cultivars that cannot be grown from seeds. How to graft roses bud grafting? How do i plant blackberry root cuttings? What are the epicotyl and cotyledon of a bean seed? What is the ideal moisture level air layering of rubber plant?